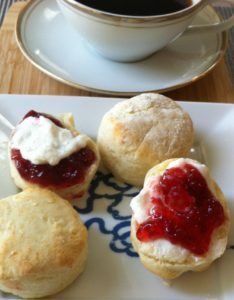 Clotted cream is an essential part of Afternoon Tea, served on scones. It is what the term “cream” in the legendary Cream Tea service refers to. Making your own clotted cream is really simple and Keto friendly. The goal is to coax the liquid from the cream. 2 methods one in the fridge which you have to tend, the other in the oven which you leave overnight. Set a coffee filter basket, lined with a filter, in a strainer, over a bowl. Pour the cream almost to the top of the filter. Refrigerate for 2 hours. The whey will sink to the bottom passing through the filter leaving a ring of clotted cream. Scrape this down with a rubber spatula and repeat every couple of hours until the mass reaches the consistency of soft cream cheese. 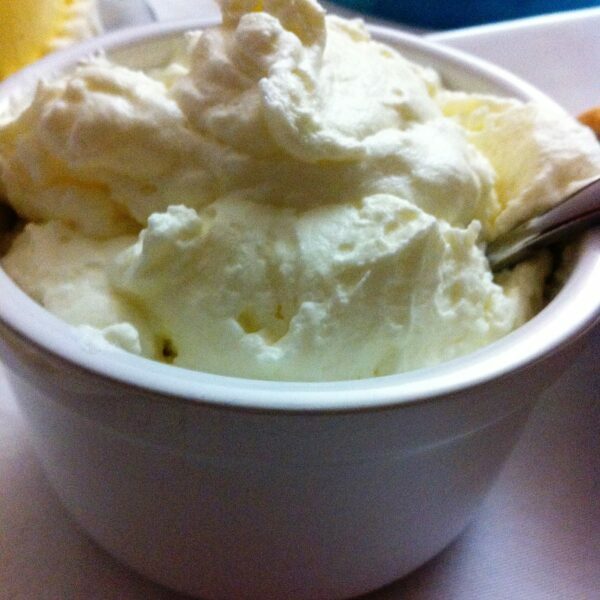 Pour the cream into a heavy casserole dish. It should come up about 1-3 inches on the side. Set the dish, uncovered, in the oven and leave undisturbed for 12 hours. Be sure to leave the oven on the whole time. I do this overnight. Remove the dish from the oven and set to cool. Then cover and refrigerate. The next morning scoop the thickened cream into a jar or jars, and cover and put back in the refrigerator for the rest of the day.